Kozhikode: The toll due to the Nipah virus (NiP), presently identified in Kerala's Kozhikode and Malappuram, rose to 10 on Tuesday even as the Central and state governments scrambled to contain its outbreak. State Health Minister K.K. Shailaja, who is now based at Kozhikode and shuttling to Malappuram, told the media that till Tuesday, 18 samples have been sent for investigation. "Of these, 12 have been identified - of which 10 sufferers have died and two are serious. The medical professionals are doing their best, even as two patients with this virus passed away today (Tuesday) morning," said Shailaja and added that 11 in Kozhikode are under observation. The virus first claimed the lives of two brothers and their aunt in Perambara near here. Even though Nipah virus, spread by direct contact with infected fruit bats, pigs or from other infected persons, infects both animals and humans, Central Animal Husbandary Commissioner S.P. Suresh, who is part of the Central team here, said that after their examination of animals in the affected areas, no incidence of virus in animals has been identified and instead it is the humans that have been affected. "No domesticated animals so far have been affected. Other aspects should be now probed as this has been now found in only human beings," he said. National Centre for Disease Control Director Sujeet K.Singh, who is also part of the Central team, told the media that all technical assistance and support is being extended by to the state. "With regards to the financial assistance, that is not decided by me. The second team of ours is reaching here tomorrow (on Wednesday) and things are well under control," he said. 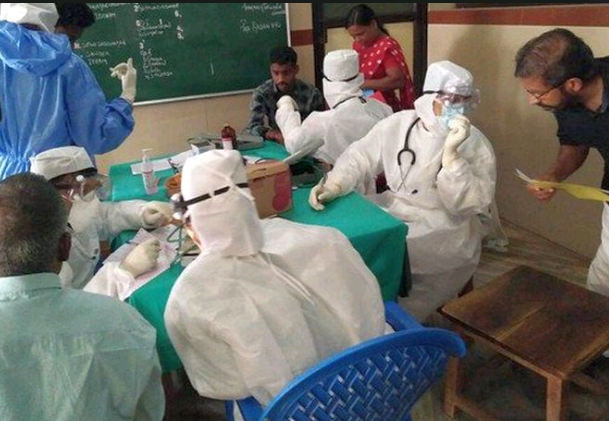 A team of medical professionals from AIIMS Delhi is expected to arrive here on Wednesday. Meanwhile Chief Minister Pinarayi Vijayan on Tuesday said that he welcomed all those medical professionals who are willing to come to the state to take part in controlling this virus. "There was a request from one doctor - Kafeel Khan from Uttar Pradesh - that he wish to serve the people who are suffering in Kozhikode. I wish to state that all professionals with a mind to serve the sufferings are more than welcome and they can get in touch with the Health Department here who will make the necessary arrangements," he said. Meanwhile, the tourism industry represented by the Confederation of Kerala Tourism Industry (CKTI) led by E.M.Najeeb, in a statement issued here, said they wish to convey to all that the concern now projected was larger than the reality. "All the tourist locations and the state in general are safe as usual for holiday activities. Tourism industry partners in the state are more vigilant and equipped to provide a hassle-free holiday to the visiting travellers. The airports, railway stations, hotels and places of visit all are following the right protocols and are free of problems as usual," he said.